4.15 - 4.17: Lenten Lunches in the parlor at 12 for lunch followed by a reflection service in the chapel. Suggested donation is $5 for lunch. Our Monthly Book Club with Pastor Amber Lea Gray is reading: Fresh Expressions. Join our closed Facebook Group to engage in the conversation, and then towards the end of the month we will meet for dinner and chat! Please join us for a service for those grieving and suffering during the holidays. We will have prayer, music and candlelight. 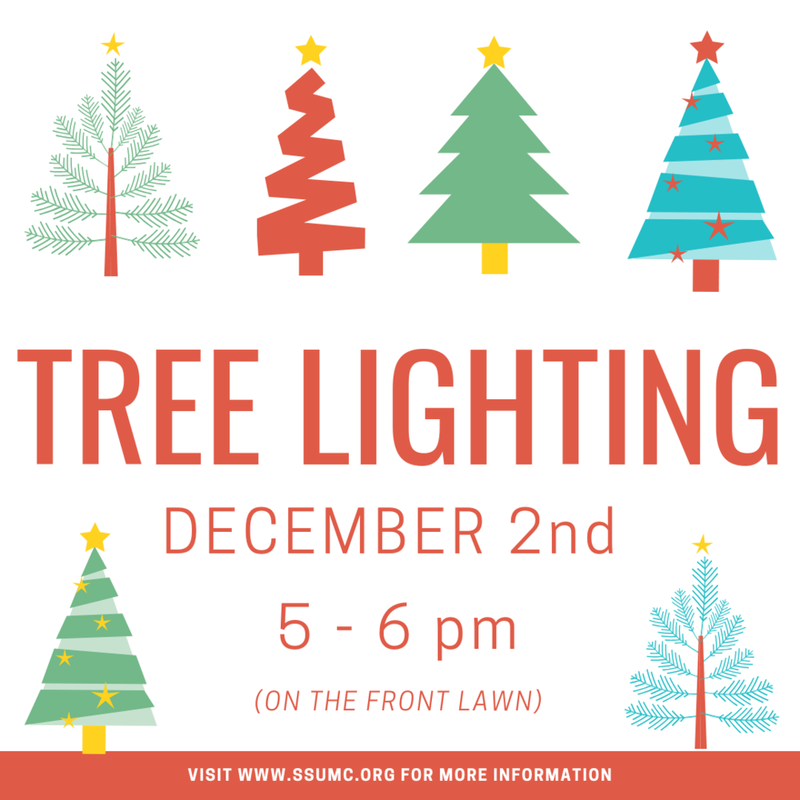 Join us on December 2nd to kick off the Advent season with our annual Tree Lighting event. There is fun for all ages! Join us every Sunday in December for our Advent series, Get Ready! Come in costume to trick or treat in the safety of the church parking lot, jump in bounce houses, have your face painted, play games, enjoy snacks, and more! 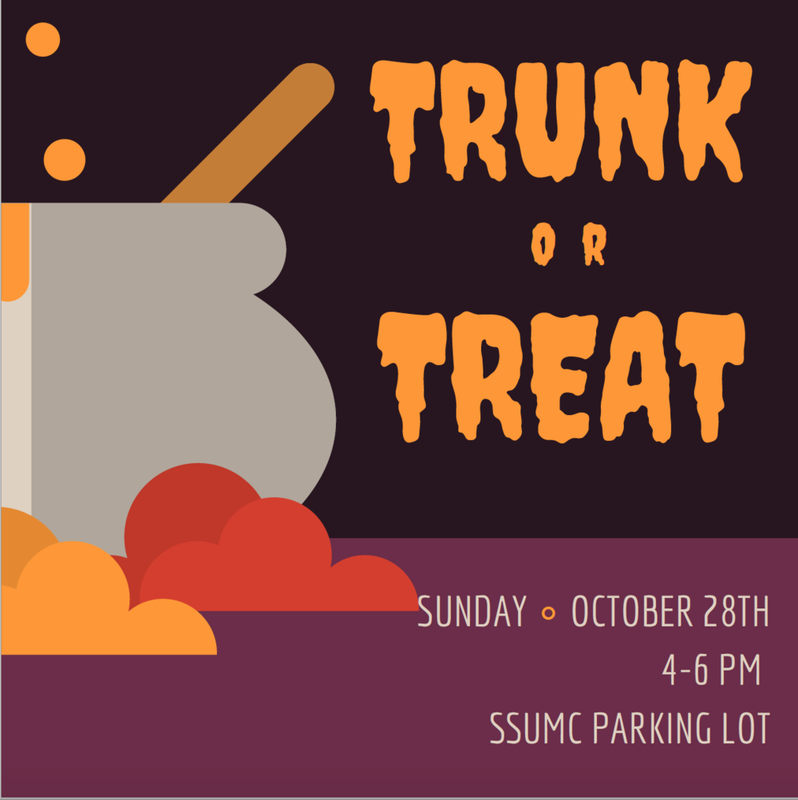 Stop by any time from 4-6 and make sure to share your vote for the funniest and scariest trunks! 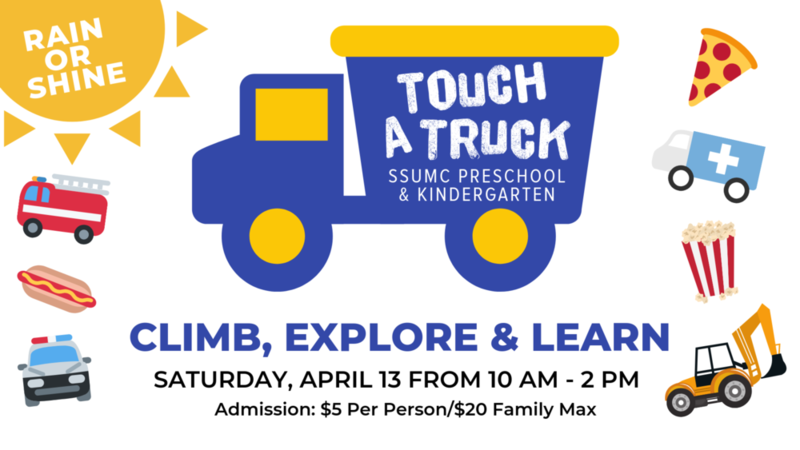 $5 entry includes wagon ride, giant slide, cow milking, and pig races. U Pick apples start at $7! Sign Up here or on sheet in Narthex! Our Monthly Book Club with Pastor Amber Lea Gray is reading: Slaying Giants, Walking on Water, and Loving the Bible Again by Rachel Held Evans. Join our closed Facebook Group to engage in the conversation, and then towards the end of the month we will meet for dinner and chat! Our annual VBS is an opportunity for children to grow in their faith and deepen their understanding of God and the Bible through singing, dancing, playing, and creating, all in the awesome community of friends and caring, enthusiastic adult volunteers at SSUMC. This year's program, Rolling River Rampage, will run from July 16-19, 8:30am-12pm. Register your child or grandchild online, or sign up to be a volunteer! Tuesday, July 10th, at 10 in the conference room: We will watch the movie "I Can Only Imagine". Our Monthly Book Club with Pastor Amber Lea Gray is reading: Grace (Eventually): Thoughts on Faith by Ann Lamott. Join our closed Facebook Group to engage in the conversation, and then towards the end of the month we will meet for dinner and chat! Join us at 5:30 pm for a time of food, fellowship, & fun! All students grades 4-12 are welcome to join us. We will start in the fellowship hall for dinner, and them move outside for games. Come dressed to get messy! The United Methodist Women are hosting their annual Tea Luncheon. Tickets are $10 and available for sale in the Narthex after Church. Join us for this time of fellowship! Join us on May 13th as the Sandy Spring UMC youth lead us in worship! Join us on May 6th at 11:00 am as SSUMC Children's ministry lead us in worship! Our Monthly Book Club with Pastor Amber Lea Gray is reading: Waking Up White: and Finding Myself in the Story of Race by Debby Irving Join our closed Facebook Group to engage in the conversation, and then towards the end of the month we will meet for dinner and chat! The Youth & Jr Youth are going to the Center for Civil and Human Rights in Atlanta! We will have lunch immediately after church, and the head out. Cost is $20. 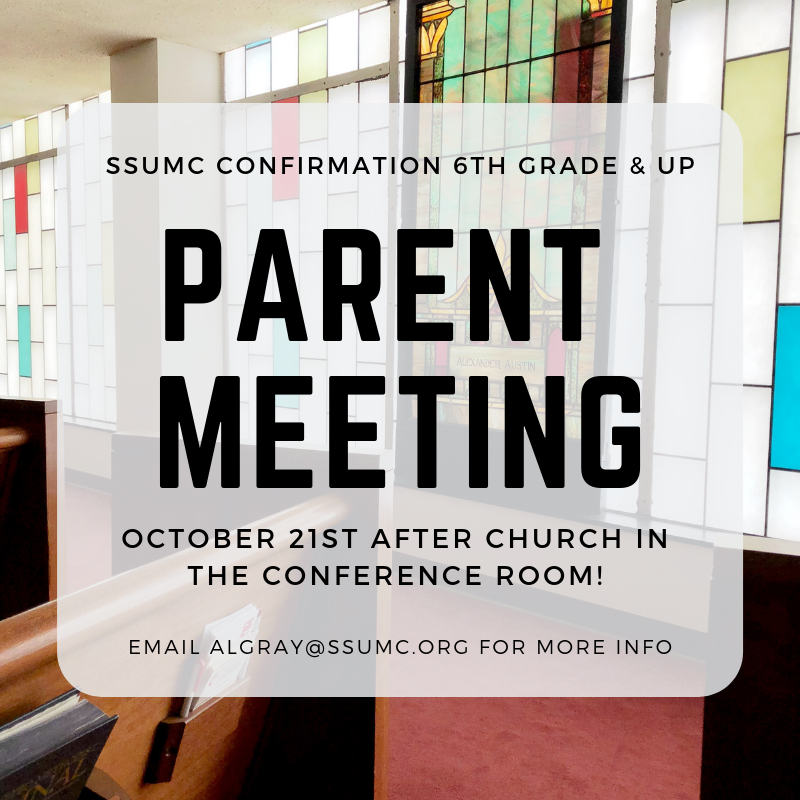 Contact Amber Lea Gray at algray@ssumc.org for more information. Bible Study: What's Your Story? Join us in the Activities Center parlor for dinner from Slopes and the Chapel for a tactile, wiggle-friendly worship service. All are welcome!